Today's ultra-light notebooks, mini, and all-in-one desktop computers now have tremendous processing power–power that many thought would only be possible in full-size workstation or large desktop computers. Smaller in size and more portable, they're very desirable. For pros in the creative fields, processing power alone is not enough. A prime example is the latest Mac Pro®. Proven to be a processing powerhouse and packed with Thunderbolt 2 and USB 3.0 ports, it lacks the PCIe expansion slots necessary to install specialty cards to connect various video and audio inputs, for transcoding data, and to connect to high-speed storage and networks. 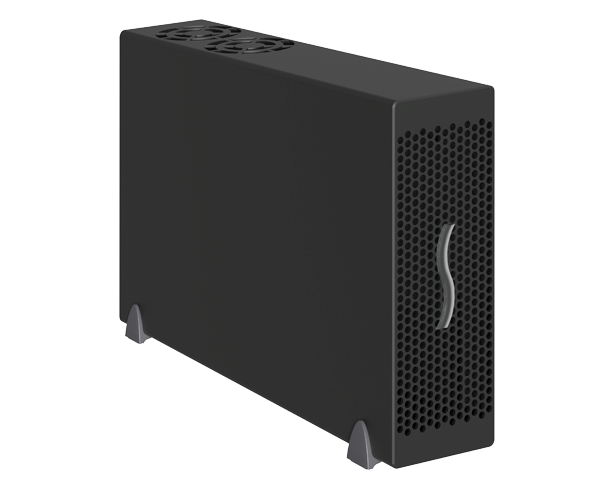 With the Echo™ Express III-D, Sonnet has created a solution that leverages the paradigm shift enabled by Thunderbolt™ technology, allowing PCIe expansion slots to be connected outside a computer. This desktop Thunderbolt 2 to PCIe card expansion system makes it possible for you to connect three professional video capture, audio interface, SAS or SATA HBA, 16Gb or 8Gb Fibre Channel, 10Gigabit Ethernet, and RAID controller PCIe cards to any Mac® or Windows® PC with a Thunderbolt 2 port. Additionally, the Echo Express is backward compatible with 10Gbps Thunderbolt technology and upgradeable to Thunderbolt 3. Echo Express III-D provides PCIe card expansion in a desktop enclosure. With three PCIe slots, you can use every Thunderbolt-compatible card supported, regardless of length or height.